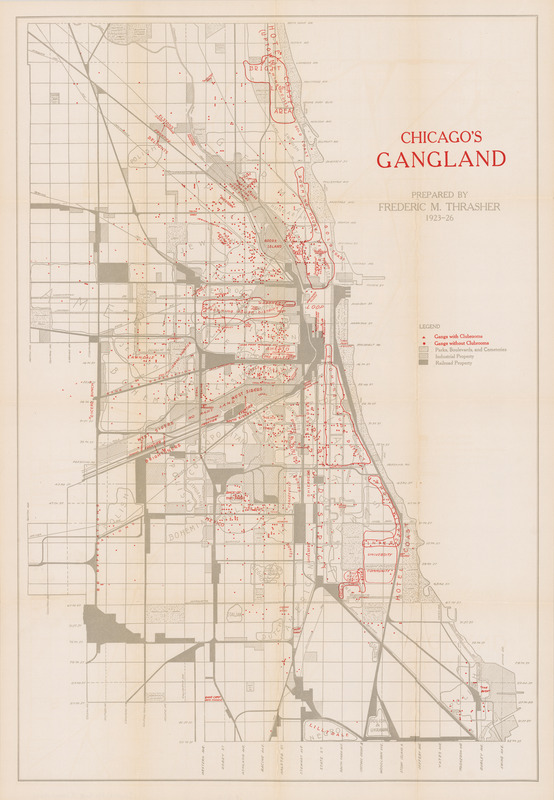 This map accompanies Frederic Thrasher’s "The Gang: A Study of 1,313 Gangs in Chicago," published in 1927, "a panoramic, multilayered, richly detailed account ... a milestone text of the Chicago School of Sociology." (Dimitriadis 2006, 335). The map illustrates "the most important conclusion suggested by a study of the location and distribution" of Chicago gangs: that Gangland isn't only a matter of geography, but of "socially interstitial" areas of the city, places where there are "fissures and breaks in the structure of social organization." (Thrasher 22). In those transitional neighborhoods, characterized by deteriorating housing and shifting population, "the gang develops as one manifestation of the economic, moral, and cultural frontier which marks the interstice." (Ibid. 23). See generally "Mapping Chicago's Gangland During the Roaring Twenties," http://bostonraremaps.com/inventory/chicagos-gangland-map/, accessed March 15, 2016. Thrasher, Frederic M. 1927. The Gang: A Study of 1,313 Gangs in Chicago. Chicago: University of Chicago Press.